Alicia Lewis, college student, camp counselor, and aspiring lawyer, stands on the steps of the U.S. Supreme Court in downtown Brooklyn. She wants to help kids in foster care like her, and possibly run for elected office one day. “There aren’t many people in office who look like me,” she said. Made possible by a grant from The Pinkerton Foundation, HSVS hired a job coach, Debbie Pierre to lead the program. “This is a supported internship program. The positions are in house and provide a multitude of job opportunities in different departments within HSVS, where they receive additional support and guidance than other Internships,” said Pierre. The program is unique because of the training opportunities, affinity groups and personalized support from their job coach. “I’m here to provide support to both the young people in the program as well as their supervisors to provide an overall meaningful experience,” said Pierre. The end goal is to bolster skills and confidence, so that young people are ready for the next step. After successfully completing the program, many participants have been connected to and landed full-time and part-time paid offers. “I’m so proud of our Go Getters and how they have grown,” Pierre said. One of those Go Getters is Alicia Lewis, a rising star headed for her freshman year at Morgan State University. “I want to pursue law, so being paired with Brooke Rosenthal was kind of perfect,” said Alicia of her supervisor, the VP of Youth Development at HSVS. “It’s one of the most positive work experiences I’ve ever had. Yes, it was paid and that was great, but I was included in meetings and asked for my opinion, especially my thoughts on the youth development programs. I was valued as a colleague, not treated as an intern,” Alicia reported. Alicia was an Executive Administrative Aide to Rosenthal, learning the ropes of office skills and culture. 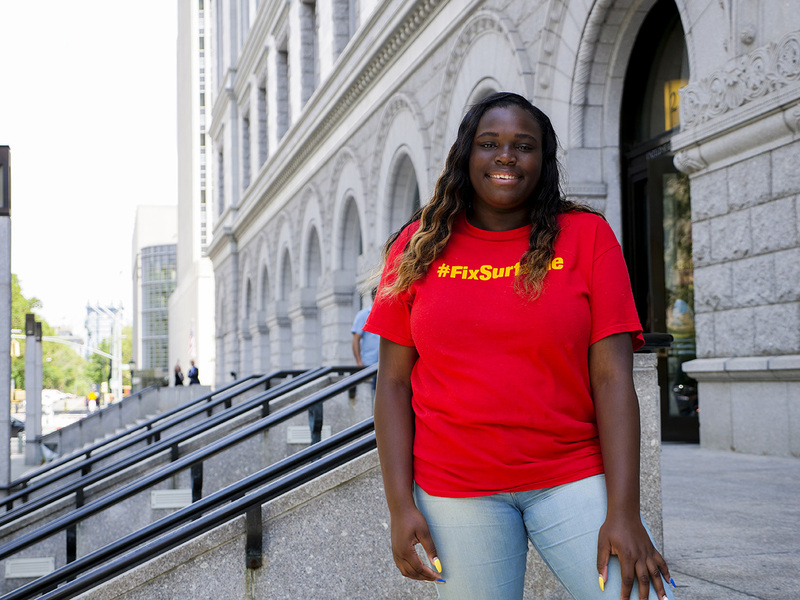 Alicia hopes to become a lawyer to defend young people like her who have experienced foster care. Then, she hopes to take a stab at politics. “There aren’t enough people who look like me in elected office,” she said. Alicia, who has lived in at least 6 foster homes throughout Brooklyn says she understands. “I used to live in Coney Island, so I know what it meant to experience Hurricane Sandy and how traumatic it was,” she explained. This perspective has helped her relate to the children and teens of Surfside Gardens Cornerstone Program. Her first stop on her mission to represent New Yorkers will be running for student government freshman year. Other Go Getters have thrived as well. Originally setting out to utilize his technical skills, Daniel Marshall interned at the Wycoff Gardens Community Program. Over time, Daniel worked on enhancing his professional and personal development during his Internship experience, where he then realized that he actually enjoyed working along side children and was later offered a position. Jade Thomas, a mother, student of Manhattan Community College and an active participant in HSVS community not only learned how to incorporate self care in the workplace, while having a busy schedule, but this experience taught her that having a great supervisor does exists in the workplace.